So what are "Accounts" in Goodbudget? The Free version of Goodbudget provides one Account you can use to track all of your spending money. Subscribers can make unlimited Accounts to keep track of every dollar in your checking, savings and credit card accounts. Both the Free and Plus Versions allow you to track unlimited Debt Accounts. ​How do Accounts work with Envelopes and Unallocated? All changes to Accounts are reflected in either Unallocated or Envelopes, with the exception of off-budget Debt Accounts. Goodbudget works to make sure your Account total and your Envelope + Unallocated total are always equal to each other, since Accounts show you where money is in real life, and Envelopes + Unallocated show how you want to use that same money. As you add your Accounts, you'll see your "Net Total" change on the right hand side of the screen. Your "Net Total" is the difference between what you have in your Checking, Savings, Cash Accounts, and what you owe in your Credit Card Accounts. This is how much you'll have to budget with in your Envelopes. When you're ready, click on the green "Save Changes" button to finish adding your Accounts. Create a "Cash" Account to keep track of ATM withdrawals and your cash spending. Enter your credit card balance as a positive number. If you owe $50 on your credit card, enter your current balance as "50." If you aren't sure what the current balance is for an Account, just enter the last statement balance you have for that Account. Then enter all of the transactions that have happened since then into Goodbudget. If you need to make a change, don't worry, you can always edit these later! You can see your Account balances and transfer between Accounts in the Accounts tab. To add, edit or delete an Account, tap on the Overflow Menu > Edit Accounts. From there, you can make your changes and save them when you’re done. Note that you cannot create Debt Accounts using your Android app. Head to the Accounts tab and tap on "Edit" to create Accounts. 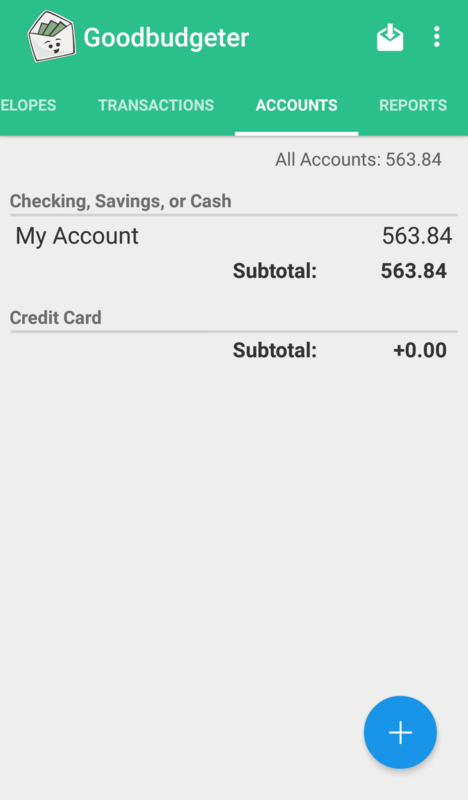 There, you can tap on "+Add Account" or edit an existing account with your current balances. Note that you cannot create a Debt Account using your iOS app.